Folk Fest 2013 was an amazing cycling success! The flow of bicycles was steady all day long. 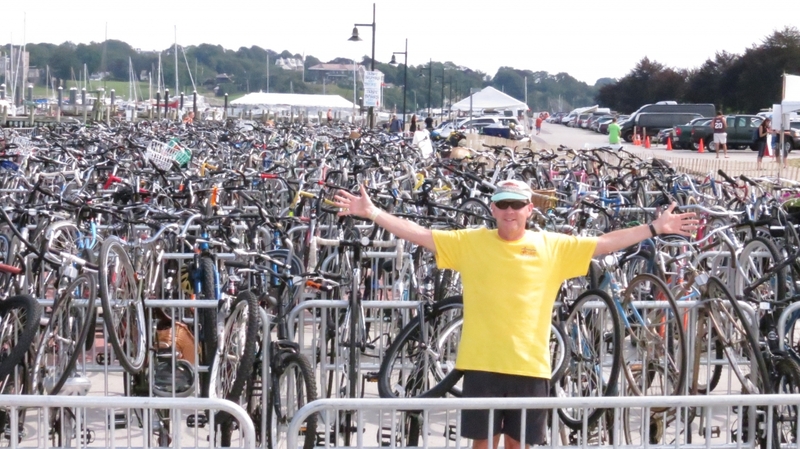 We welcomed and parked 500 bikes in Friday’s rain, 900 in Saturday’s sun, and 800 on Sunday. The reviews from cycling festival-goers was consistently positive, excited, grateful. Everyone had a great time sailing into and out of the Fort past the lines of cars. And SO many photos were taken of the sea of bikes! Social and traditional media were enthusiastic and generous in their reporting – and word has it there was even a shout-out to the cyclists from the Main Stage! Bike Newport’s support of cycling to the Festival included internet information and mapping, dedicated Park ‘n Bike locations in Newport and Middletown, on-road signage to the Fort, bike parking, bike tune-ups, and new this year – Bike Power: pedal-powered cell phone charging station on the festival grounds. Huge THANKS to our new friends at Tretorn for being the title sponsor of all bike support at Folk Fest. THANKS to Newport Grand and the City of Middletown for providing dedicated Park ‘n Bike locations at Newport Grand and the Aquidneck School. THANKS to People’s Credit Union, A2B and Newport Bicycle for making Bike Power – our bicycle powered generators – possible. THANKS to RIDOT and Tretorn for hundreds of blinking lights that helped get all the cyclists home safely. THANKS to the Newport Police Department for looking out for all the cyclists on the road. THANKS to all our friends on social media for sharing their happiness and keeping the buzz going. And, most of all – THANKS to our awesome volunteers who made the day fabulous and fun for all the biking folkies. The days were long and the work was hard and they all stuck it out in pouring rain and baking sun. We could not have done it without them! The roads will remain marked with our yellow Bike Newport cyclist signs through Bridge Fest and the Jazz Festival – to help encourage cycling, raise awareness of road sharing, and guide cyclists to Fort Adams. We all know it’s a beautiful time to leave the car home and enjoy our beautiful city on two wheels. So get out there and enjoy – ride safe and ride happy!